One of the unexpected bonuses of running my own business from home is the positive impact it's had on my two daughters. It wasn't so apparent when I was freelancing, as I spent a lot of time tapping away behind my computer screen, which meant nothing to my kids. But my wellness business is different in a number of ways. With this business, my kids can really see what it means to be in business. They get to see how there is a LOT of work that goes into every success...and how failure is not a bad thing but, in fact, a source of some wonderful lessons that can inspire you onto your next success! They can understand the pay off that comes from a consistency of effort and in taking the courage to seek out every opportunity to meet with and talk to people, as you just never know where your next idea, lead or client is going to come from. They can experience first hand the difference when you truly care for your people and your clients, how little things can add up to a big difference and how rewarding it is as, in time, they clients and team members become firm friends. And how it's important to work on your self-development every day and practice positivity and gratitude. How they have come to learn all this at such an early age is because I've made a conscious effort to involve them in my business as much as possible. I got quite emotional recently when my 8-year-old took me on a tour around the shop she had created in her bedroom. She had thought of everything! She had a beautiful window display, which she explained she'd change regularly to attract people in. She told me all about the area she'd created to entertain the kids so that the Mum's will shop more, and come back! She told me about how she would talk to people to really understand them, so she can help them find the best products for them - but above all, she'd try to make sure that everyone left with a smile. I was deeply impressed with how deeply she has taken in all my ideas and experiences and added to them with some incredible ideas of her own. We don't know what the future will look like for our children, but I strongly believe that collaboration, problem solving, creativity and entrepreneurship will feature highly, so I'm delighted to be helping my daughters develop these skills from an early age! 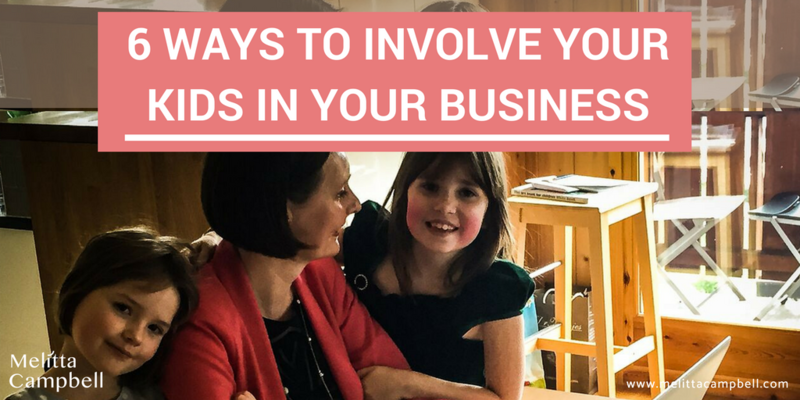 Here are some of the ways I've involved my girls in my business, I'd love to know how you involve your kids - let me know in the comments below! My girls are 7 and 9 now, but when they were younger we had a craft session where they made their very own phones and computers. They loved 'coming to the office' with me and setting up their own desks. It's just a simple activity, but my kids love helping me put address labels and stickers on products and marketing materials. I've explained to them how every small detail adds up to give a client an impression of your business, so it's important to take care to put the labels on straight. Understanding the importance of the task means they always make an effort to do a great job and are deeply proud when I congratulate them. It was a bit of a risk, but I decided to take them with me to meet some of my clients and it really paid off. The girls loved the chance to share their product stories and I enjoy showing people that it's possible to run a successful business with kids in tow. I also involve them in my client campaigns too. We discuss how we can delight customers so they know they are valued. Kids have some amazing ideas...mostly involving chocolate, admittedly, but when they tell customers there's a little something special in their bag, the girls love seeing the delight on the clients face and knowing that their idea and effort meant something. I started listening to self-development videos while cooking for the family, and the kids started pulling up a stool so they could listen too. They loved the 'stories'. Now I buy all my books on audio so I can listen to them in the car, which not only means I can get more positivity and inspiration into my day, but also means that my girls are getting a really good early business education. It's amazing to see them applying their entrepreneurial mindset to their activities and school work! One of the things I love about being a home business owner is all the quality time I get to spend with my kids. Going to Swiss school means that they come home at midday for two hours. This is a great time to discuss what is happening in our days. This is a precious time when we can be open and share challenges, successes and ideas and support and encourage each other. There's nothing more inspiring than two enthusiastic girls telling you "Mummy, you've got this. We know you can do it!". I love it when they are so excited about something we discussed at lunchtime that it spills over into after-school discussions too. It's amazing how much knowledge kids absorb. I had an early evening table-top event in a school over the Christmas period, so I took my kids along. Admittedly, it wasn't always easy. There were some moments where I found myself juggling questions from my kids and clients at the same! My kids are young now, but I'm sure as they grow I'll find lots of new and more wonderful ways to involve them in my business. As I mentioned earlier, we don't know what the future will look like and what the world of work will be like when our kids enter the workforce. But one thing I do know, creativity, problem-solving, positivity and an entrepreneurial mindset are all valuable assets that will help them tackle every challenge coming their way. So I'll continue to look for exciting ways to involve my children in my business as they grow and ensure that they have plenty of opportunities to join in my successes. So I'd love to know more about your ideas and how you are involving your children in your work (or plan to). Let me know in the comments below! How wonderful to grow up actually witnessing what your parents do to make a living! I had no clue what my Dad did. He left the house early and came home late. In between he was “at the office” doing some “stuff” I didn’t understand! Haha, my kids used to think that my husband did drawing all day in the office, watched cartoons and had a nap after lunch – it was the only world they knew and it did make me giggle. But I do enjoy involving them and showing them what it takes to succeed at anything, I think it’s an important lesson. This is really interesting, Melitta. I need to involve more my daughter in my business as so far for her it’s just an obstacle between us. Wow! I love how you manage to keep them informed and interested in your work. 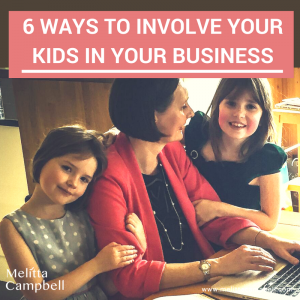 It isn’t easy working from home as it is, and it does go a long way if you can make time and patience to explain to your kids how they can be part of your business and make them feel invested. Kudos to you! Thanks Ashley, I’m glad you enjoyed it! It sounds like you’re setting a great example for them. Thanks Claire! I think they set me a good example too – they are always so creative and often find a simple solution to something I’ve been overthinking. And for them, everything is possible, it’s very inspiring! Thanks for sharing such an inspirational post Melitta. Our little girl is only three but she is an equal in our family and (when we can get a word in! ), we talk to her about anything and everything. As newly committed digital nomads, building a lifestyle brand where we will earn income as influencers, she is already part of our business. We made peace with ourselves over any issues with her privacy and will continue to be open with her about what, when and how she can join in with the family’s entrepreneurial journey. As you mentioned, who knows what sort of income opportunities will be available when this generation reaches adulthood. So why not teach them location independent income methods as early as possible. Beats doing a paper round! Haha, you’re so right Colin. According to experts 80% of the jobs our kids will have don’t exist today! How do you prepare them for that? The answer is to encourage them to be curious, enjoy problem solving, show them how to communicate and build meaningful relationships, and how to be positive and mindful…all the skills we develop as business owners, so involving the kids can really set them up for an exciting future. Good luck with your business, I love the sound of your family approach. I’d need to check with you here. Which is not something I often do! I take pleasure in reading a publish that can make people think. Additionally, thanks for allowing me to comment! Thanks Natisha, glad you enjoyed it. This is a great post and very inspirational. I love this type of parenting and I believe kids are meant to do great things as long as we, as parents, are there to show them how great things are made. Thanks for sharing such a great article. Thanks for taking the time to share your feedback Raluca, I’m so pleased you enjoyed the article.